Igniting Business Ambitions project offers FREE one to one support, workshops and business support sessions. The programme starts with a two hour appointment with Nicky Kent Business and Social Enterprise Advisor, followed by online individual and/or group workshops and direct support during Nicky's Facebook Group 'Office Hours' . The duration of the programme may vary due to your individual circumstances, but will usually consists of approx 12 hours in total support, and/or until you're formally trading (making some money) - registered with HMRC, or your business is registered with the appropriate regulatory body, e.g. Companies House. The length of time you remain on the programme is dependant on you taking action and moving yourself forward with my support. There will be business actions to complete between support sessions and workshops, but don't worry you can receive weekly phone support reviews if you need them with your advisor Nicky Kent, who will help you if you get stuck. This is a great opportunity for you to have the business you always dreamed of. If the business support and workshop content proves to be unsuitable for your individual needs we may be able to help you to find a volunteering opportunity, work placement, or employment, or refer you to another "Building Better Opportunities" support organisations, better placed to help you get where you want to go. Under the terms of the project you are required to live and/or operate your business in the Shropshire, Telford or Wrekin area. You cannot be in Work (so you should be unemployed or economically inactive - ie not working). You must agree to provide the required proof to be eligible and complete the necessary paperwork to gain FREE support. Once we have the eligibility forms in place you can then book your appointment below and manage your appointments yourself. Please contact Nicky Kent on nicky.kent@fuseenterprise.co.uk or Tel: 07816 510463 if you are struggling to use the online booking system. PLEASE CLICK ON ONE OF THE HIGHLIGHTED DATES BELOW TO CONTINUE BOOKING YOUR APPOINTMENT. ONCE ON THE PROGRAMME YOU WILL BE GIVEN NEW APPOINTMENT LINKS TO BOOK FURTHER APPOINTMENTS. You are responsible for managing your own appointments, you can book, reschedule or cancel to suit your needs. I ask for at least 48 hours notice to cancel or reschedule, where ever possible. If less than 48 hours please ring Nicky on 07816 510463 so you can talk through your need to cancel, then book your next appointment online. If your booking date and time remains on the system I will assume you need the appointment and will turn up at our agreed location. Please do not rely on texts, or emails to notify me of non-attendance, although if sent in addition to cancelling/rescheduling through Acuity Scheduling this is fine. If you cancel without rebooking I will have no way of knowing what the reason is for your non-attendance so please email me to let me know how things are, or to tell me you no longer want to receive support. When attending appointments I do my very best to get to our agreed location on time. Just occasionally my day doesn't quite go to plan, for example because of traffic delays, difficult parking, or previous meetings slightly running over (historically no more than 15-20 minutes). If I'm going to be late for any reason I will try to text you as soon as I know I can't get to you on time. Please check your mobile phone for messages and be assured you will get your allotted booking time allowance once I can get to you. I will not be able to answer phone calls from you if I'm driving, so if you need to contact me please text on 07816 510463. Fuse Enterprise take your Data Privacy very seriously under the GDPR regulation (General Data Protection Regulation), 25th May 2018. Please note: Acuity Scheduling is an American third party company that we use to book appointments. They are covered by the US Data Shield. 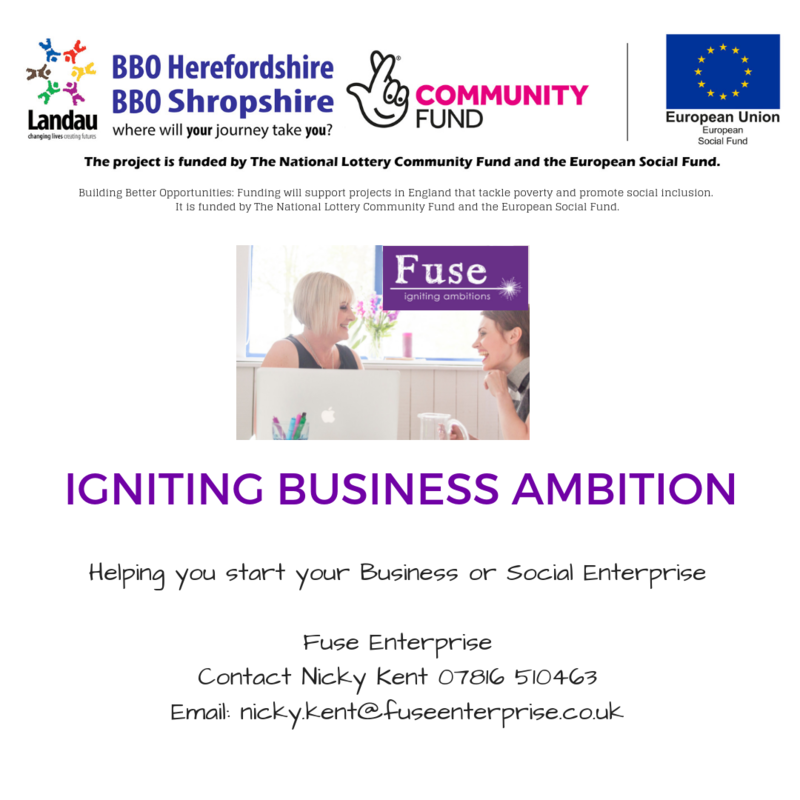 Fuse is part of the Wrekin Housing Group, working in partnership with The Wrekin Housing Trust, Choices, The Furniture Scheme, Reviive, Shire Living, The Shropshire Housing Alliance. If you would prefer not to use this software, please let Nicky Kent know by calling 07816 510463, or emailing nicky.kent@fuseenterprise.co.uk so we can make alternative appointment arrangements.